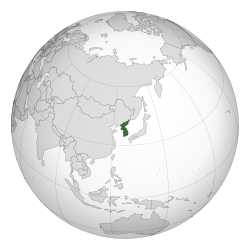 Korea (/kəˈriːə/ kə-REE-ə; Korean: 한국 Hanguk [hanɡuːk] or 조선 Joseon [tɕosʌn] – (see etymology)) is an East Asie geographic region that is currently dividit intae twa separate sovereign states — North Korea an Sooth Korea. Locatit on the Korean Peninsulae, Korea is bordered bi the Fowkrepublic o Cheenae tae the northwast, Roushie tae the northeast, an is separatit frae Japan tae the east bi the Korea Strait an the Sea o Japan (East Sea), an separatit frae the Republic o Cheenae (Taiwan) tae the sooth bi the East Cheenae Sea. This page wis last eeditit on 16 Mairch 2019, at 06:59.